Hop On and Hop Off features entertaining and informative narration of each stop. It takes 1 hour to complete the loop. You can ride the loop and hop on and off unlimited times. The Hop On and Hop Off bus stops at each stop every hour 10 minutes. You can tour at your own pace and see various attractions in the city. Your ticket is good for 2 consecutive days. Hop On. Tune In. Rock Out. Get on our air conditioned bus and take in Memphis’ unique and vibrant culture. From the Jungle Room Graceland to jungle feel at Bass Pro, soulful bass lines at STAX to base line drives at AutoZone Park, the Memphis HOP introduces you to the best in Memphis cultural attractions. You never know what you’ll find the next time you hop off. 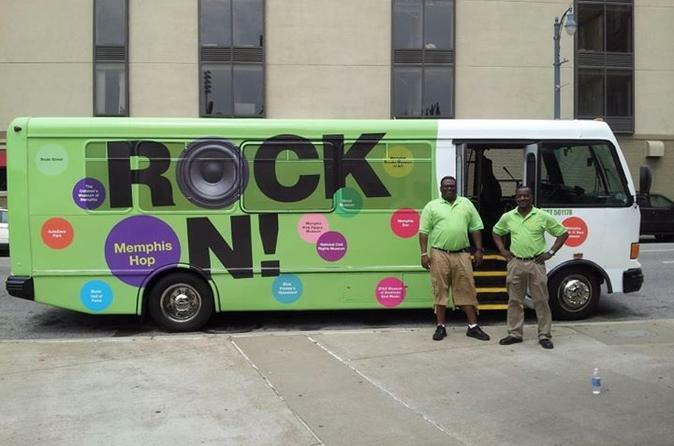 There’s no city like Memphis, and there’s no more convenient way to see it than on the Memphis HOP! Admission fees to attractions are not included and the Bus Schedule will be listed in the Voucher you receive upon purchase. The exciting stops that you will see are: The Pyramid Shaped - Bass Pro Shop, RiverFront, HardRock Café, BB King and Beale St, Graceland, Sun Studio/ St. Blues Guitar, St. Jude Hospital, AutoZone Park/ Peabody Hotel, National Civil Rights Museum / Blues Hall of Fame, Memphis Rock n' Soul, Peabody Place/ Main St and the Stax Museum.